This set of Surveying online quiz focuses on “Principle of Subtense Method”. 1. In the subtense bar method, the horizontal angle subtended by two targets fixed on a horizontal bar at a known distance apart is measured at instrument station by theodolite. Explanation: In the subtense bar method, the horizontal angle subtended by two targets fixed on a horizontal bar at a known distance apart is measured at instrument station by theodolite. The two targets are at a distance s apart, and each at s/2 from the centre, i.e. vertical axis. 2. The two targets are at a distance s apart, and each at s/2 from the centre, i.e. vertical axis. The horizontal angle α is measured carefully by means of a theodolite. Then what is the value of D in the subtense bar method? Explanation: From the geometry, D=1/2 x s x cot α/2, where, s = the distance between the targets of subtense bar, and α = apex angle subtended by targets at O. As α is small tan α/2 = α/2, D = s/α. 3. The following readings were taken with a tachometer on to a vertical staff. Horizontal Distance Stadia Readings 46.20 m 0.780; 1.010; 1.240 51.20 m 1.860; 2.165; 2.470. Calculate the tacheometric constants. Explanation: D = Ks + C, where the constant K is equal to (f /i). It is called multiplying constant of the tachometer and is generally kept as 100. The constant C is equal to (f + c). It is called an additive constant. 4. Stadia readings were taken with a theodolite on a vertical staff with the telescope inclined at an angle of depression of 3o30′. The staff readings were 2.990, 2.055 and 1.120. The reduced level of the staff station is 100.000m, and the height of the instrument is 1.40 m. What is the reduced level of the ground at the instrument? Take constants as 100 and zero. Explanation: Use D = Ks + C, where the constant K is equal to (f /i). It is called multiplying constant of the tacheometer and is generally kept as 100. The constant C is equal to (f + c). It is called an additive constant. 5. A tacheometer is setup at an intermediate point on a traverse course PQ and the following observations are made on a staff held vertical. Staff Station Vertical Angle Staff Intercept Axial Hair Readings P + 9o30′ 2.250 2.105 Q + 6o00′ 2.055 1.975 The constants are 100 and 0. Compute the length PQ and the reduced level of Q. RL of P = 350.50 m.
Explanation: Use D = Ks + C, where the constant K is equal to (f /i). It is called multiplying constant of the tacheometer and is generally kept as 100. The constant C is equal to (f + c). It is called additive constant. 6. Following observations were taken with a tacheometer fitted with an anallactic lens having value of constant as 100. Calculate the horizontal distance between P and Q. Explanation: Use D = Ks + C, where the constant K is equal to (f /i). It is called multiplying constant of the tacheometer and is generally kept as 100. The constant C is equal to (f + c). It is called an additive constant. Use formula a2 = b2 + c2 – 2 b c cos A. From the geometry, D=1/2 x s x cot α/2, where, s = the distance between the targets of subtense bar, and α = apex angle subtended by targets at O. As α is small tan α/2 = α/2, D = s/α. 7. The horizontal angle subtended at the theodolite station by a subtense bar with vanes 3 m apart is 0o 10 ′40′′. Calculate the horizontal distance between the theodolite and the subtense bar? Explanation: Use from the geometry, D=1/2 x s x cot α/2, where, s = the distance between the targets of subtense bar, and α = apex angle subtended by targets at O. As α is small tan α/2 = α/2, D = s/α. 8. The vertical angles to vanes fixed at 1 m and 3 m above the foot of the staff held vertically at a station P were – 1o 45′ and + 2o 30′, respectively. Find the horizontal distance and the reduced RL of P if the RL of the instrument axis is 110.00 m? 9. The following notes refer to a traverse run by a tacheometer fitted with an anallactic lens, with constant 100 and staff held vertical. Line, Bearing, Vertical Angle, Staff Intercept -PQ, 30o 24′, + 5o 06′,1.875; QR, 300o 48′, + 3o 48′,1.445; RS, 226o 12′, − 2o 36′, 1.725 respectively. Find the length and bearing of SP. Explanation: Use D = Ks + C, where the constant K is equal to (f /i). It is called multiplying constant of the tacheometer and is generally kept as 100. The constant C is equal to (f + c). It is called an additive constant. From the geometry, D=1/2 x s x cot α/2, where s = the distance between the targets of subtense bar, and α = apex angle subtended by targets at O. As α is small tan α/2 = α/2, D = s/α. 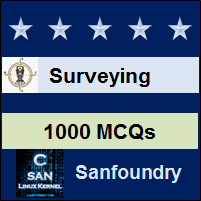 To practice all areas of Surveying for online Quizzes, here is complete set of 1000+ Multiple Choice Questions and Answers.